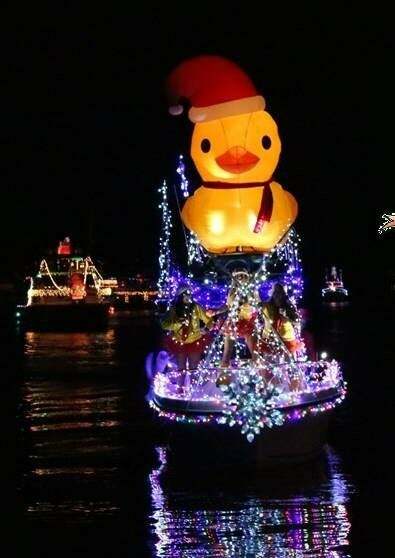 Santas in shorts, snowmen that don’t melt, and even a large rubber ducky are sights you may see during local Christmas Boat Parades. 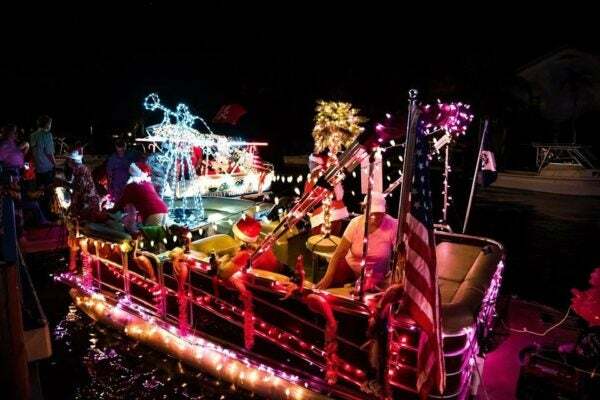 The 29th Annual Fort Myers Beach Christmas Boat Parade takes place on Saturday, Dec. 2 from 6 to 8 p.m. The Bonita Springs Christmas Boat Parade will be held Dec. 9 at 5 p.m. And, the Cape Coral Christmas Boat Parade is Dec. 16 from 7 to 10 p.m.
Any community can have a parade, but only waterfront towns can have a Christmas Boat Parade. And if you’ve never seen one, you owe it to yourself to see this type of fun, spectacular display. Boat owners enjoy decking out their decks with lots of colored lights, inflatable holiday decorations and music. You’ll see many varieties of trees, and nods to animals such as dolphins that are found near Fort Myers Beach. Each year, more and more boaters participate. Look for more than 30 boats at each parade this year. There are many places where you can have a good view, and a good time, while watching the spectacle. The Fort Myers Christmas Boat Parade begins at Salty Sam’s Marina and will pass by Parrot Key Caribbean Grill, Matanzas on the Bay, Nervous Nellies, Doc Fords, Dixie Fish Co., Shrimp Dock, and Bonita Bills. The route is focused on the bay, not the Gulf, as it goes though Matanzas Harbor and the first two canals of Siesta Isles. The hammerheads at the end of those canals are a great spot to set up a lawn chair to watch the event. Another good viewing location is the fountain next to Nervous Nellies. 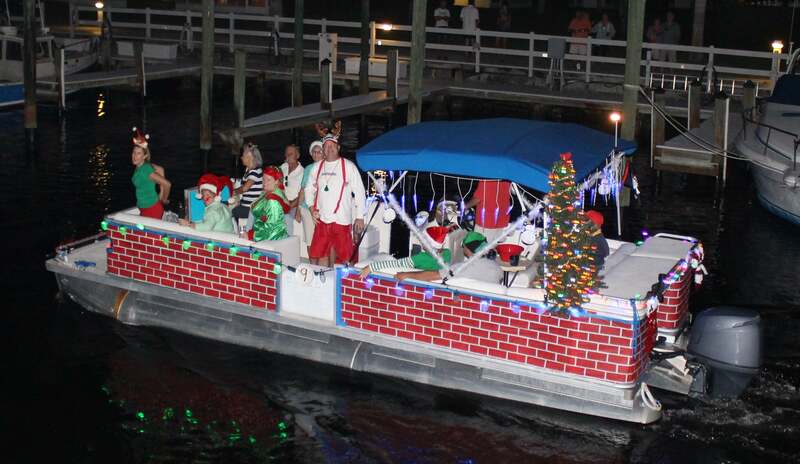 The Bonita Springs Christmas Boat Parade begins and ends at Bay Water Boat Club, which is hosting a private event. Watch anywhere along the Imperial River, especially at Riverside Park in downtown Bonita or the bridge at US41 that goes over the river. In Cape Coral, boats line up in Bimini Basin for the start of the parade, which passes by the beach before heading down various canals. There will also be food vendors, Christmas music, crafts for the kids, a movie and a visit from Santa Claus. Some bleachers will be set up, but bring your own chairs/blankets to make sure you have a place to sit. Find free parking with shuttles to Four Freedoms Park at the field lot next to the corner of SE 8th Court and SE 47th Terrace in Downtown Cape Coral. There will be shuttles picking up and dropping guests off at the event at Four Freedoms Park. If you can’t get enough of bright seasonal colors, Edison & Ford Winter Estates Holiday Nights runs through Dec. 31 and is a must-see. Now in its 42nd year, Holiday Nights features decorations, children’s activities, museum exhibits and more at the Florida Historic Landmark and a National Register Historic Site. This 21-acre complex in Fort Myers was the adjacent winter homes of Thomas Alva Edison and Henry Ford. Book your holiday getaway with Sun Palace Vacation Homes.